Welcome to another Flashback Friday post. Where everything old is new again! 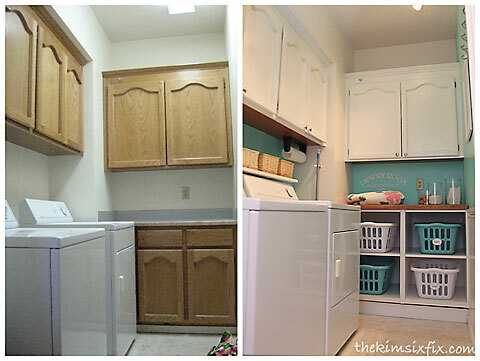 Today I'm sharing one of the first rooms I re-did when we moved into this house, the laundry room. It was my first attempt at painting the oak cabinetry and I wanted a room where it wouldn’t matter too much if I didn’t like them. Nobody will typically see them. Luckily for me, hating them wasn’t a problem. I loved how they came out. The cabinets are painted Glass of Milk (by Martha Stewart) since that is the color of all the trim in my house. It is VERY WHITE. When I painted the kitchen cabinets I ended up with a much darker color. The wall color is Mermaid's Song by Valspar. I chose it because it reminded me of the color of liquid fabric softener. Random, but true. This also was my original experiment in determining how well the paint would hold up with wear and tear. I painted these cabinets back in 2011 and the photos in this post were taken today (June 2014.) You can see how well the paint has held up. Even in the hot, dusty, damp laundry room. The other big feature I ADORE about this room are the laundry basket cubbies that I made from doorless ikea base cabinet boxes (detailed description and photos of the process can be found here.) 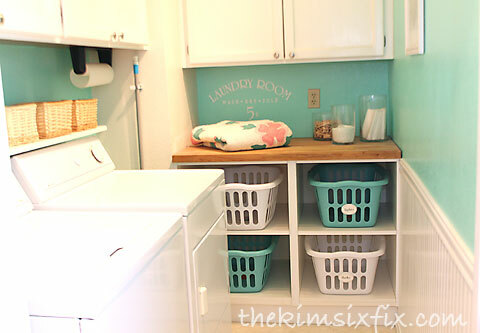 If I ever have another laundry room in any other house, I am going to try to finagle a way of putting them in. I updated the lighting (taking down a fluorescent fixture and adding a wonderful Halogen track light. The color of the light in the room, and the increased brightness are great for finding the stains in the laundry. I also installed beadboard along one wall to make the room feel more ‘homey’ and less ultiliatian. You don’t typically see artwork in a laundry room, I thought it was completely apropos and definitely better than the electrical panel. Other changes include adding a shelf above the washer and dryer with baskets for storage. Since the original reveal I have added a small silver tray that I found at the thrift store. It is perfect for collecting all the ‘treasures’ I find in my kids pockets. Marbles, coins, buttons.. I needed a place to collect them. I used the hooks on the wall all the time, for drying bathing suits and other things I don’t put through the dryer. Sharing at HomestoriesAtoZ and these parties. It all looks lovely! I love the paint color inspiration ;P. I really, really, really want to paint my oak kitchen cabinets this summer....so glad to hear your opinions on Martha's paint. The laundry room looks amazing! I love the color and the organization! Go for it Diane! You won't regret it!